I was speaking to a Ukrainian friend who asked what kind of food we enjoy in Australia during Easter. I thought about it and said, 'We don't really have any Easter specific food, except for maybe chocolate eggs.' Shameful! 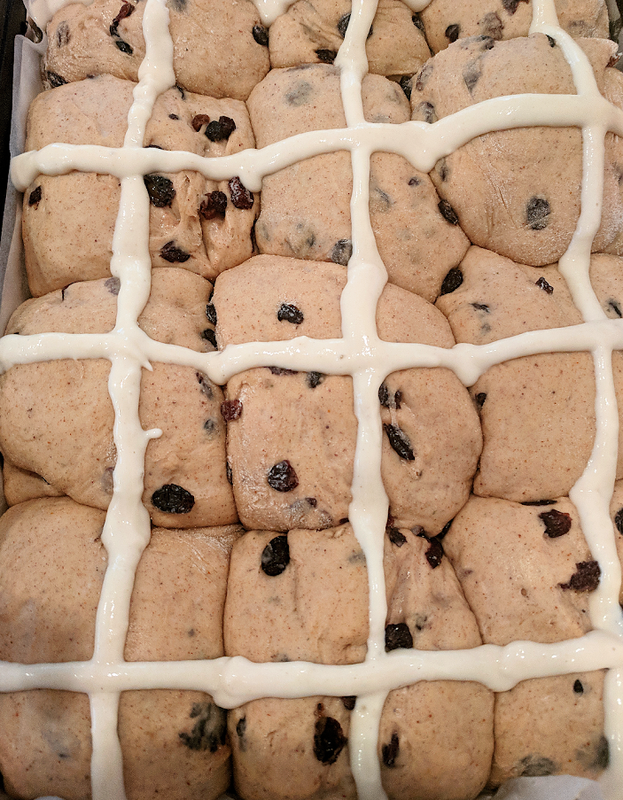 How could I forget about the magnificent hot cross bun! Store bought varieties of this soft and filling treat usually use dairy and eggs, and have loads of sugar added on top of the already sweet dried fruit. My Super Soft Hot Cross Buns are not only free of dairy and eggs, but are lower in sugar than your average bun. They take patience and a keen eye, but you'll be so satisfied when you smell your glorious warm buns in the oven (that sounds weird but I assure you I'm being genuine), and feel a fabulous sense of accomplishment. In my experience, any kind of bread or pastry making is really rewarding. You can add extra dried fruit, mixed peel or whatever you have on hand, and more sugar if you like a sweet bun. They taste divine when warmed up, but can store in an airtight container for a couple days and freeze well. This recipe makes 12 big ones, but you can divide the mixture differently if you want them smaller - just heat them up when you're ready to eat, add a schmeeeeer of vegan butter go for gold. Place currants in a medium sized bowl and cover with boiling water. Set aside. In a large jug, combine yeast, milk and sugar, stir to combine and set aside for 15 minutes. Meanwhile, place flour, cinnamon, mixed spice and salt into the bowl of a stand mixer fitted with a dough hook, and mix until well combined. Increase the mixer speed to medium, and slowly half of the milk mixture. Add maple syrup and continue to mix, then add remaining milk and butter, waiting until each addition is incorporated before adding more. Beat on a medium to high speed for 5 minutes, or until dough is smooth and elastic. Spray a clean bowl with olive oil and place dough into it, covering with at least one thick tea towel. Place bowl into a warm place and leave to rise for 90 minutes. Preheat oven to approximately 190 degrees Celsius and grease and line a large rectangular baking tray with baking paper, spraying lightly with oil before use. Once dough has risen (it should double in size), pour onto a well floured work space. Knead the dough with your hands for a minute, adding more flour if it feels really sticky. Drain the water from the currants and pat dry. Roll dough into a large rectangle and sprinkle half of the currants evenly over the surface. Fold the dough twice and keep kneading to combine. Repeat until you have no currants left. Cut the dough into 12 pieces (or more if you want them smaller), place into prepared tray, cover again with tea towels and leave to rise for 30 minutes. Meanwhile, combine flour and maple syrup in a small bowl, and slowly add soy milk until you have a runny paste. Spoon mixture into a small piping bag, and once dough has risen, pipe crosses onto each bun. Brush melted butter over each bun. Place the baking tray into the oven and bake for 30-45 minutes, or until buns are golden on the outside and soft on the side (insert a skewer to check). Serve warm and store in an airtight container for a few days at room temperature or freeze.